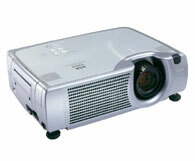 We stock a range of professional XGA projectors ranging from relatively portable to install grade XGA projectors. Like the rest of our projector stock, our XGA projector hire stock is less then 6 months old and we have multiple matching units for situations where duplicate screens are required. Our bottom of the range XGA projector hire stock consists of Phillips CClear XG1 Brilliance & the Hitachi CP-X430 units, both of which we have found to be reliable in use and most importantly, capable of producing perfect, high quality moving & still images. The brightness of both these units is very good when compared to other similarly rated models from other manufacturers. Both units are rated in the 2500 - 2600 ANSI lumens range which is probably sufficient for presentations of up to about 100 people (depending upon the ambient lighting circumstances). For situations where these projectors are not powerful enough we have a model one step up also from the Hitachi XGA projector range which offers a fairly hefty 4500 ANSI lumen output. This projector is suitable use in large scale presentations, lecture theatres and faily large auditoriums. We can supply larger projectors if required - please call or email us with your enquiry and one of our AV technicians will be happy to advise you. 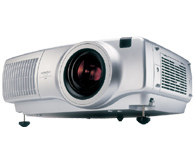 XGA Projector Hire Stock - Glasgow Projector Hire - Details are specified below in terms of our available XGA projector hire stock dimensions, weights, brightness, inputs etc. We have provided a range of XGA Projector brochures in downloadable pdf format, plus there are links to the manufacturers website allowing software downloads enabling computer remote control of these XGA projectors (where available) via either wired (RJ-45) or wireless networking, or via USB. Please read on for details.